I could have sworn this didn't do that before I had to reinstall windows. Is there anything I can do to fix this? No it does not. Is that the cause of this? If so how do I get that file? It's there. Got excited when I thought I couldn't find it. And if you double click it? If I double click it I get the same error I posted about. Sorry, just to chip in. 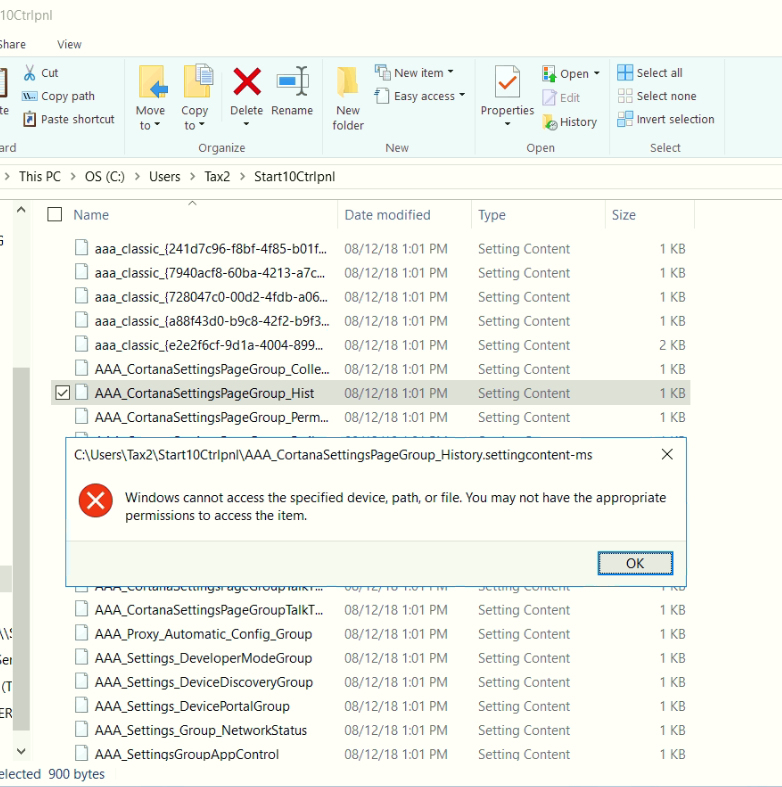 From your last respond and actually from your first post it already hinted that, your problem is that you, somehow, seem do not have full ownership of files & Folders in Windows 10. Something went wrong when you reinstall Windows 10. The problem not really from Start10 since you also get the same result went you double click directly on the file itself. I suggest try some solution on "Taking ownership of Files & Folders in Windows 10" available on the net. Try it. Hope it help. Why would ownership be any different than the first time I installed Windows 10? I did nothing special during the install. Everything is at whatever the default is for Windows 10. Also what exactly should I take ownership of? I took ownership of the Start10Ctrlpnl and it still happens. That something I can't answer. Looking at some comments from microsoft forum from people with similar issues as yours. I took ownership of C: and it still does it. What version of Windows 10 are you running - is it a pre-release one (and early ring)? Nope it latest version of Windows 10 fresh install. Version 1803 Windows 10 Pro. OS Build is 17134.228 if that matters. I have the same issue on Windows Home ver after the last update. Called Windows Update and they had me run DSIM ,,, RestoreHealth @ Admin then SFScannow - no change. It seams that Searching for Windows Update under the "Old Win7" links causes the permission problem for Settings and Advanced Settings Links. My main associated problem (not StarDoc) is those idiots at Microsoft still think it is OK to REBOOT my machine without the Users Permission. Same Issue. Clean Windows 10 1803. 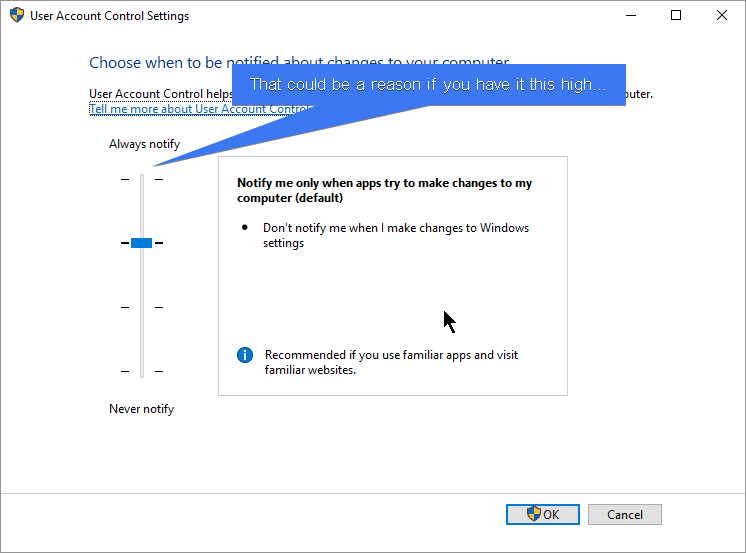 NONE of the Windows 10 control panel items work. See blow. Please report this bug. Thanks Intrepid-LI for sharing this. I missed it on TF somehow. I've got the same issue with lots of built-in MS tools. Typing their names into the search box produced the "cannot access the specified device, path or file" error. But navigating in through the UI or using the command line works just fine. For example "reli" normally calls up Reliability Monitor, but instead provokes the error msg. If I type "perfmon /reli" or go through Security & Maintenance, it opens just fine. Odd! Thanks again for sharing this. Hope the Stardock guys get it switched over to the new URIs soon. I've created a dozen or so that I use often. Type 'Truk' or 'Update' into a Start10 search and it should show and work. The naming is up to you, of course. Here are 17 fixed shortcuts of the most popular items. If you don't remove the non-functional shortcuts first, they will continue to appear in searches. Wow! I was starting to think I had done something to cause these problems. I will be looking forward to Stardock's official fix. These bookmarks are kinda annoying that they ask if it is ok to open them each time. But still awesome find Intrepid-Li! I've tested them on two Windows 10 v1803 machines and have not received the annoying OK to open warning. I have updated the file in my previous post to 17 shortcuts. hese bookmarks are kinda annoying that they ask if it is ok to open them each time. But still awesome find Intrepid-Li! Nah it's not that. It's because it was downloaded from the net. There is a Unblock check box in the General tab for each file. It will do till Stardock fixes it. The ironic thing is that this workaround simply re-enables one to get to arguably useless Win 10 Update Options. Now here's an Opportunity for Start 10 differentiation! It would really be great if Stardock came up with a clickable Option in Start 10 to show the much more useful Windows 7 Update options. and since MS has only the impotent Win 10 code - Have for ex the Option to temporarily Turn Off Windows Update (with the Registry edits - Save; disable the relevant keys) so we could stop Windows from Forcing an Update (like we used to -- say waiting a few weeks or a Month until it is reliable) and especially Stop Windows from automatically Rebooting our machines after their Forced Updates. It will turn the WU service off if it's on, on if its off. You could pin / put in flayout the unzipped file to Start10 and run it as you see fit. Remove the 'pause' from the batch if you do not want to have to interact with it. Sweet including chking for admin rights - and shorter than the Save / Restore I do with the registry. Just wanted to pitch in here and say that I'm having this problem as well. When can we get a fix?